The eighth annual Under Armour All-America Game is in the books with the National Team defeating the American Team, 11-5 on Saturday afternoon at venerable Wrigley Field in Chicago. Fans in attendance saw multiple elite-talent pitching and hitters leaving the ballpark with home runs. Out of the gate, fastballs reaching 96 mph were thrown by starters Riley Pint (National) and Alex Speas (American) as well as pitcher Forrest Whitley in the second inning for the American Team. Gregory Veliz also lit the radar gun up, touching 95 mph on his fastball for the American Team in the third inning. Yerzy goes yard in the second inning of the All-America Game, a two-run shot. Offensively, in the second inning, an opposite field home run to left field by power-hitting Canadian-catching prospect Andy Yerzy and later, a grand slam to left by catching prospect and Floridian, Michael Amditis, helped the National squad put the game out of reach. Yerzy received the Under Armour Silver Spikes Award for the National Team, while Carter Kieboom picked up the Silver Spikes award for the American Team. Kieboom had a nice afternoon with the bat, picking up two hits in three at-bats, scoring two runs and stealing a base. National Team outfielder Taylor Trammel reached base in all five of his at-bats, drawing three walks, a single and a hit-by-pitch, also scoring twice. Trammel picked up the Gatorade “G” Award, for displaying the most hustle and soul. American Team catcher Cooper Johnson put together a nice game behind the plate and with the bat, going 1-for-2 with an RBI and a walk. The junior showed off a cannon of an arm behind the dish, flashing a 1.81 pop time and picking off Trammel at second base in the third inning. Cooper took home the Kelly Kulina Award for the player showing the best attitude, work ethic, dedication and enthusiasm. In the middle innings, the pitching dominated the hitting as Mitchell Miller (1 IP, 0 hits, 1 BB, 1 K), Garrett Gooden (1 IP, 1 hit, 1 K) and Travis Hosterman (1 IP, 0 hits, 2 K) pitched well in relief for the American Team. On the National side, Jesus Luzardo pitched an 1 1/3 of scoreless ball with a strikeout, while Graeme Stinson (1 IP, 2 K), Anthony Molina (1 IP, 1 BB, 1 K), Rian Haire (1 IP, 1 K) and Jonathan Gettys (1 IP, 2 K) all turned in scoreless frames. Before the game, Bo Bichette won the Home Run Derby, defeating Joey Wentz by a final score of 10-7. In game, Bichette had a solid day at the plate, twice just missing huge RBI opportunities. Overall, he finished 1-for-3, with a triple, an an RBI on a hit-by-pitch. He also walked twice and scored a run. Defensively, Bichette made two outstanding plays in the top of the eighth, ranging to his right to snare a line drive off the bat of Johnson and then ranging to his left in short right field to make the grab on Grae Kessinger. Wentz, the runner-up in the Derby, went 1-for-2 with an RBI single in the third inning. 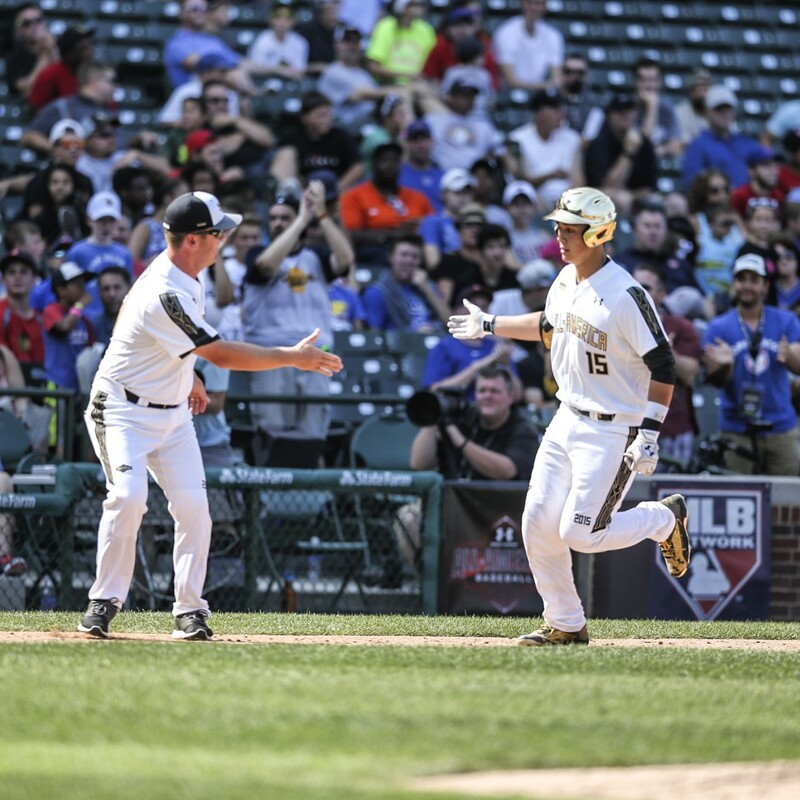 In attendance, 160 scouts saw the All-American players from their workout at the University of Illinois at Chicago, all the way through the All-America Game at Wrigley Field. 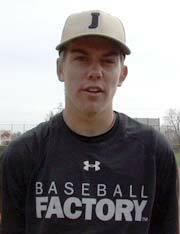 Scouts from all 30 Major League Baseball teams were on hand for the showcase.